Snatchin' up the sweet deals! My friend Donna and I went to the Ladies Lifestyle Show yesterday! We had such a great time, checking out all the vendors. It was really neat seeing all the businesses and talking the owners. TIP*** Always have diaper wipes handy in your scrap area, they are nice to wipe ink and chalk off your hands. **Challenge** Scrap a page using the color Pumpkin. Have fun and show us your pic! Halloween is coming! I have GOT to take my son out to pick his costume before all the fun ones are gone! My daughter has hers she will be a Monkey I will post pics. We still have some kits left and Daisyd board book kits, but they are going fast! Both are Halloween themes. 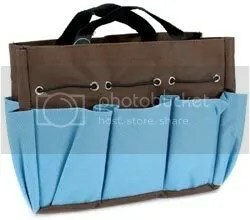 Also, if you have a minute we have 8×8 kits at www.scrapbookpagekits.com there are other kits there too from a mix of companies. New kit clubbers get a gift!! Wow! Oh my gosh! All new Kit Clubbers are going to get a cool tote check it out! The great news is that all our current KitClubbers will get one too!! We had our class last night at the park, it was so much fun! I hope the students has just as much fun! And I do hope they are at home JOURNALING, since I let them leave without doing it. It is so important to do this. We still have some of our Oct. 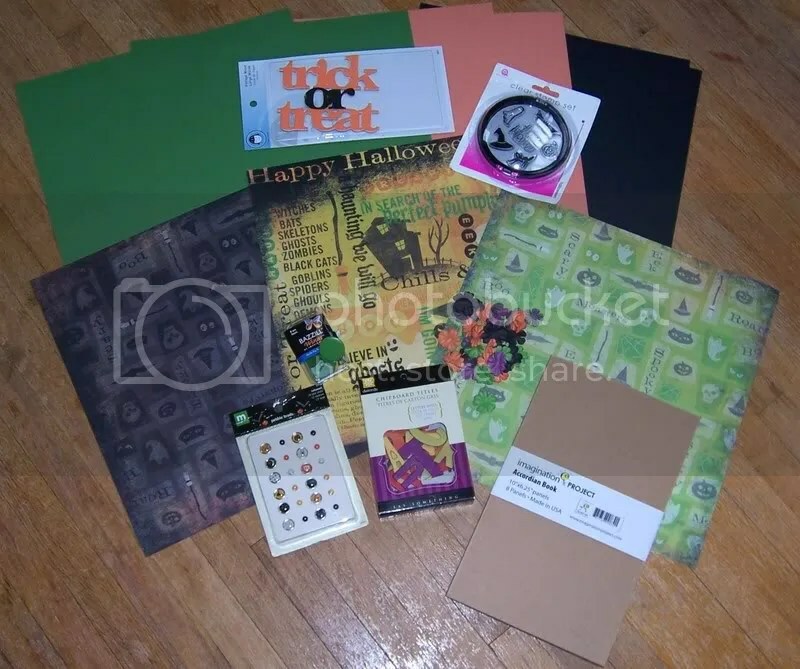 Kits available from the KitClub , it is a fun Halloween kit, featuring Karen Foster paper, Queen & Co clear stamps, Prima Halloween flowers, and much more!! I will be posting some neat pictures of some neat things you can do with this kit! Cut all papers in 4×4, then use your corner rounder on one edge. Page 2 use black cardstock and a strip of orange and add a Vintage tag, 2 prima flowers and a brad. Page 3 Black Card stock, black paper clip, tie thread to the clip, and slide onto orange matt, 2 primas and brad. Back Cover Large polka dot paper! Kit available for 5.00 to complete this beautiful mini book! I was at Spoon River Drive yesterday, it was so cold!! I took my tent down and came home after the show was over and decided to not go on Sunday. I missed not being able to go to church, my kids, and I HAVE alot I want to do at the store , kits to get ready etc. So my heart said pack it up and go home. SO hopefully I will be able to post my Coaster “Boo” Book! I really want to share this with you all and if you would like to get the kit to do, instead of tracking down the pieces I will have those available to you all. I am going to get to work and get that posted. Find some pics to put in your new “Boo” Book, these books will be 4×4 size, so a wallet size would probably work best! The class tonight was great! I still have a few empty seats if you are interested! You will be making an awesome album that can be passed down for years. The story of you! I wanted to share an awesome site with you, if you are a card maker this is for you and if you are not it is still for you! Saturday was World Card Making Day and some companies sponsored it by giving out some inspiration, have a look. Make a journaling block using a card front. If I had to think of a color for Columbus Day it would be orange. What color do you think of? Today we went down to the RiverFront to the see a ship that was like a replica of the ships that Columbus would of sailed in. It was called the Nina, it tours as an exhibit. Then we played in the park and then went to have hotdogs. It was nice to spend time with the kids since I was gone all weekend! When you think of you, what color do you think of? Scrap a page using that color and shades of it. Well it was hot again, but still it was better than rain. It was slow from what the other vendors said, maybe they are going to wait until next week when it is going to be cooler. We will see. I talked to alot of people and found some needs of scrappers, so I will be planning some classes for those needs. I can’t wait!! Scrap a page using the colors pink and brown or blue and brown, if you want post it back here for us all to see. Well, I am back from SRD, it was fun and the people were so friendly! It was a little on the HOT side– ok alot on the hot side. It was a great day and I met alot of scrappers. And some future scrappers. I talked to some of the people about the classes I will be doing at the East Peoria Park AD. building. You can see the info at www.fondulacpark.com A great class will be starting this Tuesday, it is called a Year of You, but I am going to change the name of it to This is Me, This is Who I Am! I am really excited about this class, it runs for 4 weeks and we complete an entire album of YOUR life. Isn’t that fantastic? And what an awesome thing to share with your family. Well have a great evening.